Homepage. 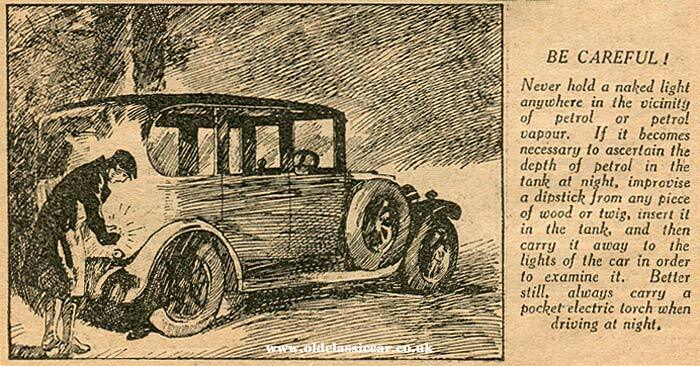 This page: A copy of a free motoring supplement offered by a magazine in 1931. 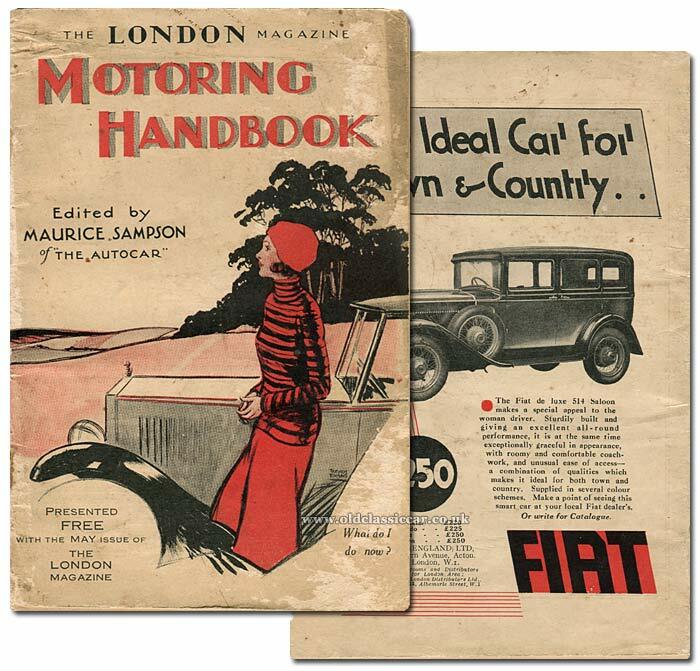 The London Magazine "Motoring Handbook". "What do I do now?" whimpers the panicked young lady on the cover of "Motoring Handbook", a free supplement offered with the May 1931 issue of The London Magazine. Clearly her motor-car (of indeterminate make) has encountered a roadside fault, hence her predicament. If only she'd had a copy of Motoring Handbook in her glove compartment. 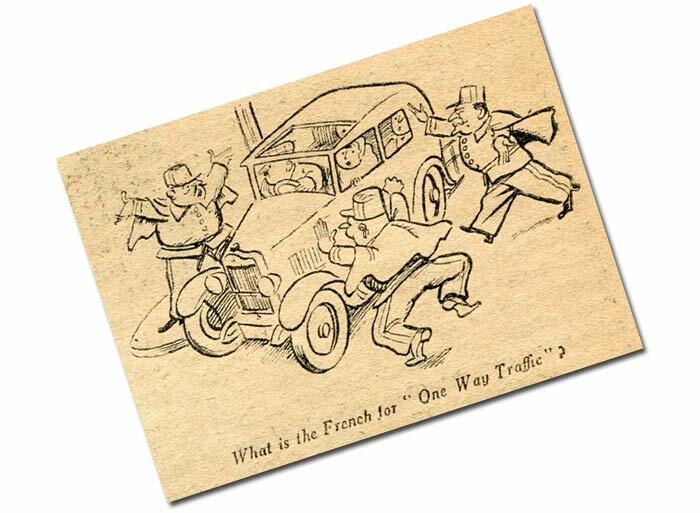 For within its 64 pages can be found wisdom regarding all aspects of buying, owning and operating a car on the busy roads of the 1930s. The cover artwork is credited to illustrator Treyer Evans, an artist whose work featured in many publications, including books by Enid Blyton, and Punch magazine. Contributions have been gathered from a number of sources on behalf of The London Magazine, with editing conducted by Maurice Sampson, of The Autocar magazine. The rear cover hosts a full-page advertisement for the Fiat 514. "The Fiat de luxe 514 Saloon makes a special appeal to the woman driver. Sturdily built and giving an excellent all-round performance, it is at the same time exceptionally graceful in appearance, with roomy and comfortable coachwork, and unusual ease of access - a combination of qualities which make it ideal for both town and country. Supplied in several colour schemes. Make a point of seeing this smart car at your local Fiat dealer's." Running In The New Car. "...It used to be common practice for some of the important motor manufacturers to issue a warning that a speed of over 20 to 25mph should not be attempted until the car had run, say, 500 miles. One firm at least went even further and used to fit a washer in the inlet pipe so arranged as to restrict the flow of gas from the carburetter to the engine. This automatically limited speed ... The practice was abandoned because it rendered cars somewhat unresponsive in traffic on occasions when it might be necessary to move quickly." Do's And Don'ts For Drivers. 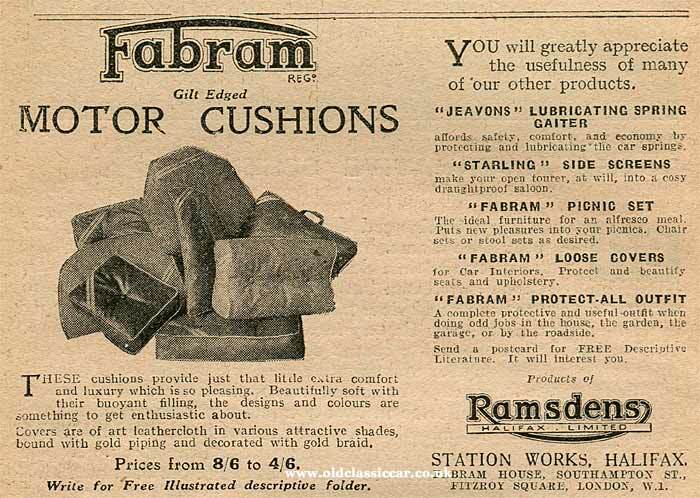 Sprinkled among the articles are advertisements for popular motoring products of the time, these include North British & Rapson Tyres, Nuswifta fire extinguishers, Lucas-CAV-Rotax car batteries, Chemico flushing oil, Fabram gilt-edges motor cushions, and - curiously - Expanda expanding cuff links, and rifles by the Midland Gun Co. 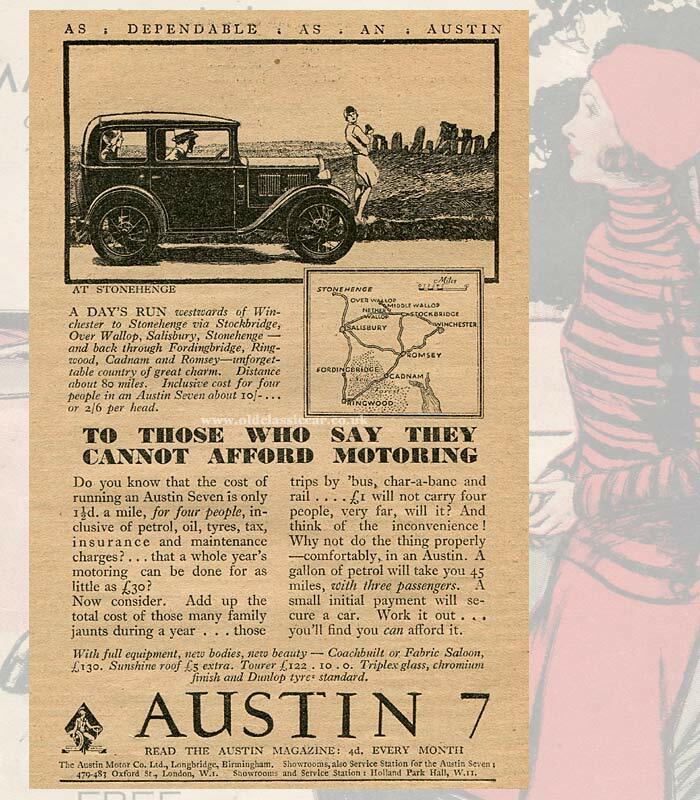 There are also full-page advertisements for the 1931 Austin 7 box saloon, and the four-door Singer Junior. Two ladies and two gents are shown with their pint-sized Austin 7, admiring the spectacle that is Stonehenge. The commodious interior of the Singer Junior four-door saloon greets the reader on the next page, a "lavishly coloured catalogue" for which will be gladly sent by the Coventry-based firm. 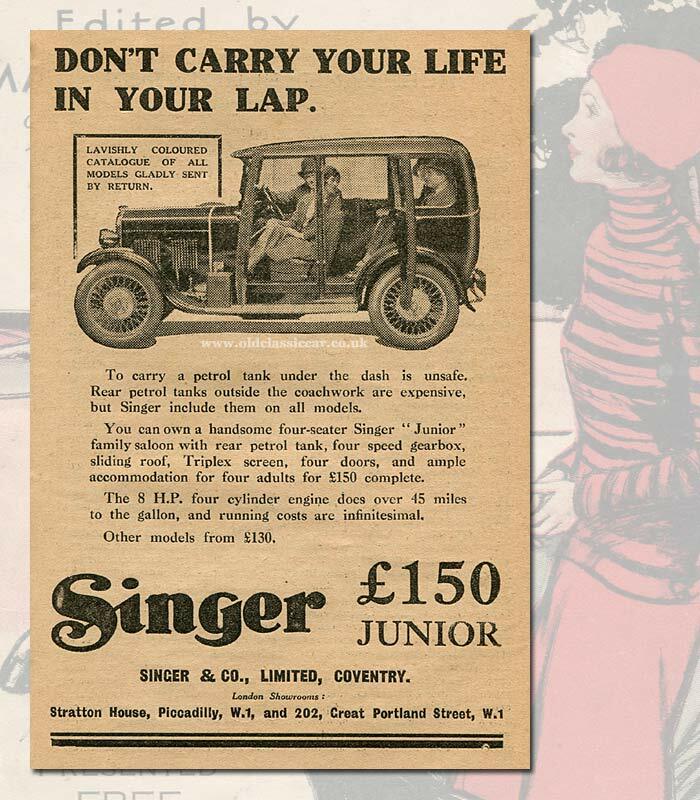 Here they choose to remind potential buyers how unsafe it is to have a gravity-fed petrol tank above the knees of the car's front-seated occupants (as was the case on early Austin 7s). Singer were proud to confirm that, despite the expense, all their models featured rear-mounted fuel tanks. The Junior also benefited from a standard four-speed gearbox, Triplex glass, four doors, and an 8hp (RAC) engine that could better 45mpg. No surprise then that they were a popular choice. By coincidence, perhaps, the article facing the Singer advert concerns itself with causes of car fires, and their prevention. Period photographs of both cars may be found elsewhere on Old Classic Car, namely here for the Austin 7 box saloon, and here for the Singer Junior. Throughout the handbook there are articles which no motorist of the day could fail to find of use. Hand signals are covered on page 16, not just those proferred by motorists, but also those given by police officers entrusted to manage traffic at, say, particularly busy road junctions for example. 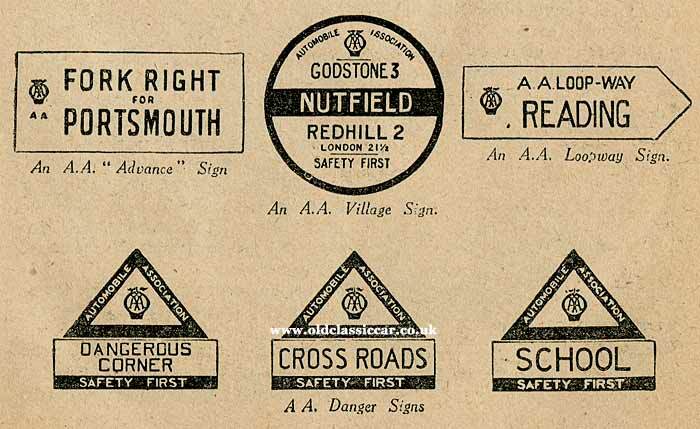 Road signs, including those issued by the Automobile Association (AA,) are also illustrated. Many of the latter were removed a few years later during WW2, in a bid to delay the progress of enemy soldiers along British roads, had they ever invaded the British mainland on foot and by road vehicle. Because of this, coupled with years of decay, few of the village-, town- and city-specific signs survive today. Other topics, such as touring abroad and how to buy either a new or used motor, receive ample coverage in the remainder of this publication. The final subject tackled by the various contributors to this handy guide, is titled "Useful Accessories". Here, an introduction to the many varied and wonderful aftermarket accessories that are available is given. These include such mod cons as an electric cigarette lighter, parcel nets for the roof of a closed (saloon) car, a gradient meter, and who could forget the optional second windscreen wiper, for the front passenger's benefit? Perhaps this handbook was issued on several occasions by The London Magazine, or was it a one-off? Either way, it serves as an interesting insight into the world of motoring in the late 1920s and early 1930s, when cheap small cars such as the Austin 7 in its various guises, accompanied by other popular models such as the Ford 8, the Hillman Minx, the Vauxhall 10 and the Morris 8, brought affordable private motoring to - and expanded the horizons of - an increasing number of people. Return to the Motoring Collectables section for more items relating to pre-war cars and motoring.